Find the writing spot(s) that work for you. Nobody but YOU is going to write your dissertation, so you determine the rules of where, how, and when you write! Don’t feel bad about not going to the office if you are more productive somewhere else! The Cito office has a flex policy that does not facilitate my chaotic writing process, so I prefer to write at home. Recently, I’ve added working at my parents’ garden to my writing spots. It is ideal because it makes me enjoy the weather and still be productive. Big advantage is that they cook me dinner and there are no distractions I usually have at home (e.g. our cat). However, this great writing spot, might also come with some disadvantages. For example, my parents’ neighbours have small children who like to play outside. Headphones or ear plugs might be a good option then in order to keep out that noise ;-). A huge – and frustrating – part of writing is thinking, plan time to ‘just sit’ and stare into an empty void to think before you start writing. Keep going to the gym or participate in whatever sports you were participating in. [taking lunch walks also counts ;)] Your dissertation is a huge priority in the end, but it is not and cannot be the only thing you care about in life, your health is incredibly important and solely writing your dissertation will drain your energy. Sports can be nice way to do some of the thinking (Tip 2), while keeping your body physically in shape. More importantly, set goals before you do sports, in science it often takes a lot of time to reach a goal, in sports you could, for example, reach a goal every 2 minutes. You make the rules, and if you do not reach a goal, you can often easily adjust your goal and still feel productive. It is especially important to not punish yourself on “bad” writing days by not going to the gym. Not so much into sports? I would recommend Tip 4. Invest time in cooking dinner or prepping lunch. Dinner is also a very excellent way of creating short term goals that will make you feel productive and happy! Especially baking bread or something that involves kneading dough (home made pizza = awesome) is a nice way of preventing RSI from working with a computer all the time. Moreover, while making dinner you’ve got thinking time to connect everything what you’ve read with what you want to write. Also, doing the dishes or cleaning the house seem like procrastinating, but are actually opportunities to create some distance and think about what you want to write. Plus the energy you get from feeling productive helps you to get back to the actual writing. Note that, things such as watching TV and facebook are actually procrastinating activities because they do not help your thinking process, they just make the time pass…. watch out for activities that numb your brain, such as drinking alcohol. Find a daily word count goal that works for you. Even when it’s only 100 words, once you crossed that you are allowed to feel productive about your day, and reward yourself by working out and preparing good food or by doing whatever you like to do when you are not working on your dissertation. On “bad” writing days I focus on making tables, pictures or update reference lists so that I still reach my 1 page a day target. Time pressure can help you oversee how long you are supposed to write. 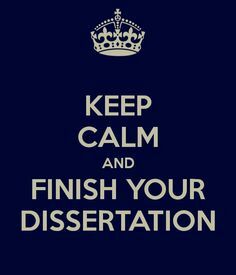 As writing your dissertation might seem like a process without an end, you might create an end for yourself. Also it is a good way of agreeing with yourself on how long you should work before you can take a glance at facebook or do something different. You can use eggtimer (the link is now scheduled for working 1 hour, but you can fill in the time you yourself find pleasurable to work with) or something like Strict Workflow, an app Saskia referred to in her blogpost in May. Get yourself in a sleep schedule that works for you and create opportunities to write during the moments you feel more energized. Also, writing is a very intensive process, so try to get at least 7/8 hours of sleep everyday. You need your sleep to be able to think clearly the next day. Although Jorine provided these tips with the finishing-your-PhD-phase in mind, you probably also foundsome useful tips in here when you are in a different phase; as many phases in PhD life contain writing and struggles to keep it going. Have you got tips to add to this list? Any other comments? Please share them! By the way, this is the last blogpost for a while. Summer has come and we will take a break from blogging. We will return in the new academic year. Hope to see you then!